Published by the American Geophysical Union as part of the Geophysical Monograph Series, Volume 168. The distribution of H2O in the Earth is under debate. Although liquid water covers 70% of the surface, the oceans represent only about 0.025% of the planet's mass-far less water than thought to have been present during Earth's formation. If our planet is "missing" most of its original water, could it reside in the mantle? Can we detect it seismically? Recognition of the capacity of some deep-mantle minerals to absorb water has propelled an interdisciplinary field of research addressing these two questions, and more. Earth's Deep Water Cycle advances the field with experimental, modeling, and seismic studies that focus on the physical characteristics of "hydrated" minerals, the potentially H2O-rich transition zone (410-660 km depth), and our detection abilities. From experimental synthesis and physical properties measurements to geophysical observations and geodynamic modeling, we are beginning to understand what parameters and data are needed to detect or refute the possibility of water in the deep Earth. 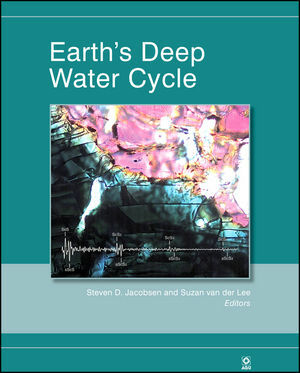 Steven D. Jacobsen and Suzan van der Lee are the authors of Earth's Deep Water Cycle, published by Wiley.